Last week the task was to visit your blog like you do other people's blogs and to make a list of the things you like and dislike about it. This was to get you to think about your blog like your readers would. Hopefully you made some notes about the types of things you'd like to work on to improve your blog. 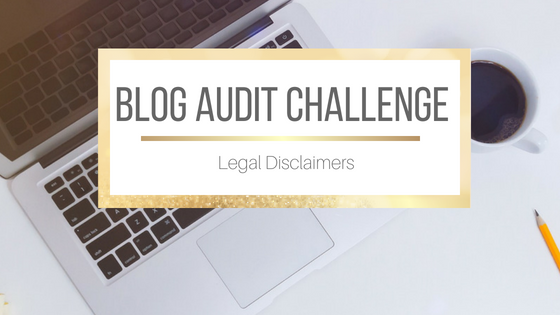 Today we're looking at the legal aspects of blogging. I'm sure you've all heard about the GDPR by now, but that's not the only thing you should be including on your blog as far as disclaimers go. I have a Legal Disclaimers page here on the blog (http://www.jolinsdell.com/p/disclaimer-this-is-personal-blog.html). This is basically my everything legal page to make sure I'm covered, and that everything is clear to users of my site. As a book blogger, I also have a page for my review policy (http://www.jolinsdell.com/p/book-blogger.html). This is important both for authors and publishers who want to contact me about reviewing their books, and for my readers so they know I will always give an honest review regardless of how I got the book. This is basically what disclaimers are for; to make sure everything is clear and out in the open. Not only do they cover you legally, they also help build more trust with your readers as they can see how transparent you are about how you work. This week I'll be taking a closer look at both these pages and making sure they are both up to date. Your task this week is to make sure you have legal disclaimers on your own site and/or make sure they are up to date.